The Fallout board game and its New California expansion from Fantasy Flight Games did an impressive job of translating everything that works about the series to a tabletop format. But if there was one area they were lacking, it was combat – especially if you’re a fan of the isometric classics. Battle strategies were streamlined into abstract dice rolls across the world map, and you often never fought more than one opponent in the same round. Enter Fallout: Wasteland Warfare from Modiphius Entertainment. This tabletop miniatures combat game places a stronger emphasis on the tactical elements of Fallout’s S.P.E.C.I.A.L system, accounting for weapon ranges, movement distances, line-of-sight, and more. If it were any more authentic to Fallout’s mechanical roots, you would hear the in-game Pip Boy sound effect that signifies combat has begun. As you might imagine, Wasteland Warfare’s core experience is effectively a tabletop adaptation of the isometric gameplay of Fallout 1 and 2. Each match begins by placing miniatures, weapon cards, and setting pieces onto a play area before activating units in sequential order. 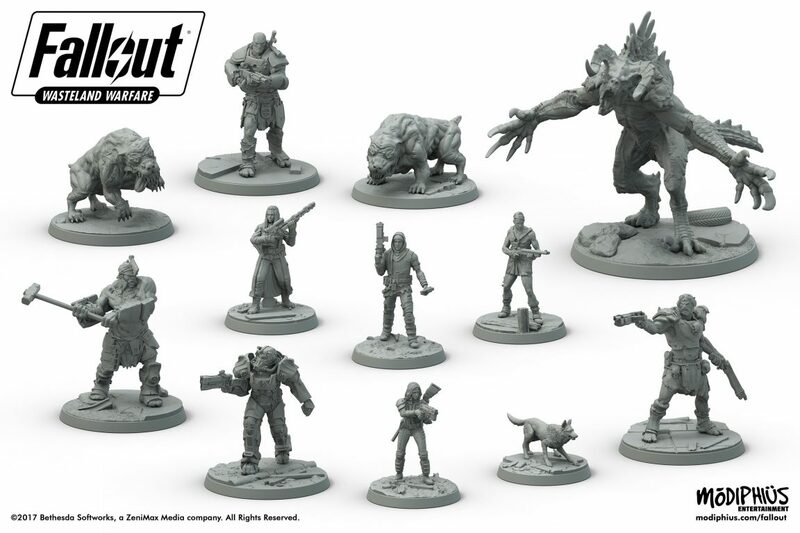 Match setups are limited only by your imagination and number of miniatures at your disposal: the starter set lets you pit human survivors against super mutants, or find out whether Dogmeat could take out a Deathclaw single-handedly (you monster). Much like Fantasy Flight Games excelled at adapting Fallout’s narrative experience, Wasteland Warfare succeeds at recreating Fallout’s turn-based strategy. Details such as armor, unit movement, and even visual range combines into detailed and granular combat where players need to think before making each action. Despite these complexities, Wasteland Warfare is easier to learn than most other miniature games at your wargaming store, making it an ideal choice for new players. That being said, new players will have a few common genre conventions to get used to after opening the box. Each figure is unpainted, and individual paint colors are sold separately. The starter set includes two basic battlemaps, but doesn’t include terrain, multi-floor buildings, or other visual elements you’ve seen in promotional materials. You’ll need to assemble environments, either by prepping abstract terrain features using construction paper or purchasing expansions from a wargaming outlet. These features are par for the course in the tabletop miniatures genre, but Fallout video game fans might not be used to the experience. The good news is Wasteland Warfare’s build-it-yourself approach lets you customize Fallout scenarios to your heart’s content. The standard gameplay experience covers 1-2 player tactical combat scenarios, with room to scale for larger groups when you have enough miniatures. With enough expansions, you could theoretically design an epic, multiple army conflict worthy of the catch-phrase “War never changes”. Just be warned that if you do this using official expansions, the price tag will add up – the current Vault Tec complete set is priced at over $1000. Of course, Fallout was never a purely tactical series, so Wasteland Warfare does attempt to incorporate other systems from the series. Searchable item tokens replicate the experience of scavenging ruins. Survivor cards offer random character interactions. There’s even an event deck that covers everything from surprise combat encounters to colorful quotes heard over the radio. While the range of possibilities aren’t as comprehensive or narrative-rich as the core Fallout series, they do help create the feel of an immersive world. Wasteland Warfare even includes solo and co-operative rules that let non-player factions run themselves. Each miniature includes an AI card that lists automatic actions on a dice roll table. These actions are modified by the character’s overall health, determining whether it fights or runs away in key circumstances. The AI features aren’t especially comprehensive or even that smart: strategy isn’t exactly designed for the whims of dice. But it’s enough to let players cooperate against opponents without getting bogged down in complicated AI flowcharts. There are even options for longer, narrative-based sessions. An included campaign book includes pre-designed scenarios that can be mined for inspiration, or linked together into larger campaigns. Yet Wasteland Warrior’s best feature here is Settlement Mode, which introduces streamlined mechanics for base-building. Using this rulesset, each player group maintains a settlement that can be upgraded using character abilities and caps scavenged during play. As structures are unlocked, players are granted additional benefits such as extra exploration actions, or drawing additional item cards before entering the next scenario. These narrative features go a long way towards making players invested in context-free miniature battles. Unfortunately, they aren’t nearly as robust as what Fallout players now expect from the video games. Wasteland Warfare lacks Fallout’s narrative depth and branching path story, even with the campaign book’s optional concessions. Fallout: Wasteland Warfare’s modular format could salvage this detail for many players. Anyone who also owns the Fallout board game from Fantasy Flight Games could merge them together for a best of both worlds experience. One could easily imagine using the board game as a world map, while Modiphius’ battlemaps handle immediate tactical combat. If you’re looking for a complete Fallout adaptation however, you won’t find it in the individual games. That said, if you’re specifically looking for a Fallout miniatures game that puts tactics first, you can’t go wrong with Wasteland Warriors. The miniatures are well-designed. Its gameplay is detailed but not overly complex. There’s lots of room to incorporate new expansions and custom rulesets. And – most crucially – you can play as Dogmeat, leader of a mutant dog pack, without downloading a Fallout mod. Vault Boy would approve.